Rugs are often the centrepiece of the room. And if you have a beautiful, oriental rug, it may be the most expensive piece in your room at that. As a result, you want to ensure your rug holds up to the test of time. While oriental rugs have earned a reputation for endurance, they still need protection from their natural enemies in the home. From sunlight to moths and beetles to moisture, join the team at Woods Rug Laundry to discuss our top 7 tips for oriental rug care! All rugs, but especially oriental rugs, need to be protected from too much sunlight. Exposure to too much sunlight might be one of the biggest enemy of the oriental rug. Sunlight coming from a window or skylight directly onto a rug – whether synthetically or naturally dyed – will fade. Further, as the rug is not entirely exposed to light the colours in your rug will fade unevenly. The wool and/or cotton will also dry out and become brittle. As a result a beautiful rug will be spoiled in a month or less if exposed to direct sunlight. Now this doesn’t mean you can’t have a rug in a sunny room. As long as your rug isn’t exposed to direct sunlight, then your rug should be fine. Further, some rugs will be fine in the sunlight while others will not. There is simply no way to know in advance. You can also help mitigate the issue by having your windows coated with UV filtering film, or keep the curtains closed. 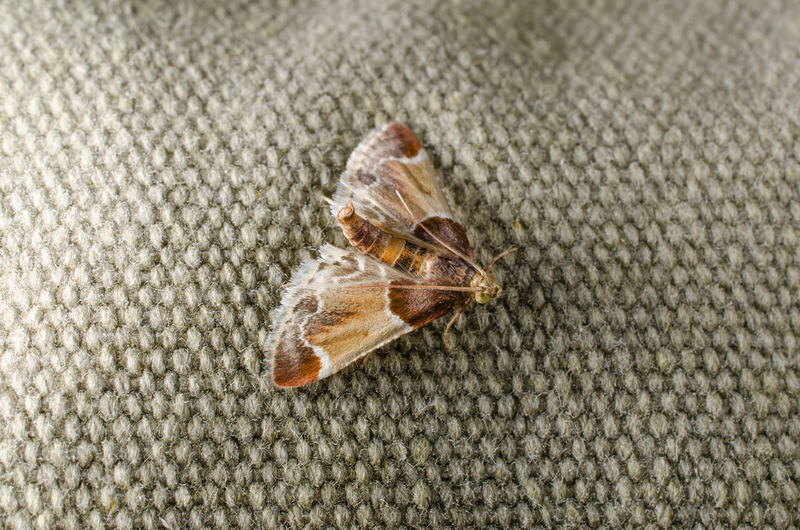 The second biggest enemy of your oriental rug is moth damage. The kind of moths you most need to worry about are generally small and hardly noticeable. These are generally the same moths you might find in pantries or wool clothing. Generally they do harm in their larval stage as they eat tracks through wool rugs. Further, the moth larvae can eat right through the rug foundations, leaving behind a web like material. This devastating damage can be caused in a matter of weeks. However moths rarely infest rugs that are in regular use. They prefer rugs that are undisturbed, generally ones that are kept in storage, and in dark places. As a result, rugs that are walked on, vacuumed and swept are generally not at risk, unless there are parts of the rug that rest in undisturbed places, such as under furniture. If your rug has any parts that generally rest under furniture, then it is recommended that you regularly rotate the rug to prevent moths settling in. Check the back of your rug regularly for tell-tale signs of moth damage and book your rug in for regularly cleaning by a professional. It is important to the health and safety of your rug to not let it sit wet or stay wet too long. When a rug remains wet it develops mildew and eventually suffers from dry rot. Aside from spills from drinks or in-home cleaning that failed to dry out the rug sufficiently, dry rot can occur from potted plants placed on rugs. Too often we see a horrible rotting ring on rugs where a potted plant has been left sitting. As a result we recommend never placing a potted plant on a rug, even if it sits in a saucer. No matter what measures you put in place, water will get into the rug and the rug will mildew and rot. This rot can also expand up to a foot in diameter, completely ruining a rug. Further, a rug that has been improperly stored – for example, in a leaking garage or attic – can become wet and begin rotting without anyone realising. In the best case a rug will only develop mildew and while this can be treated the smell of mildew is impossible to remove. Finally, water damage to rugs can cause the dye to bleed and run. Even if your rug does not develop mildew or rot, the dye run can be difficult or impossible to repair depending on the extent of the bleed. Stored rugs are generally the most vulnerable victims of moth damage and water damage. This is due to the fact that they are left in dark, sometimes damp places, completely undisturbed. 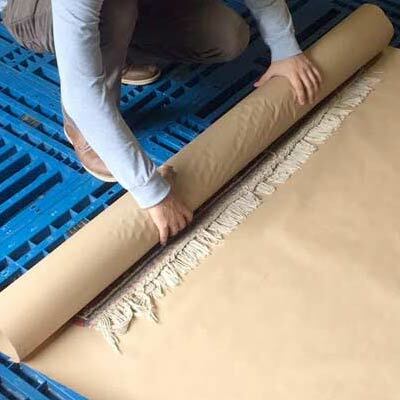 It is important when storing rugs to ensure that they are carefully sealed and wrapped – something that can be done by a professional service like Woods Rug Laundry. Care should be taken to ensure no existing moisture, insects or contaminates are wrapped in with the rugs. Plastic, rather than paper, is a better option for wrapping as insects can and will eat through paper. Further, the rug should be stored in a safe, dry environment, where nothing can pierce the wrapping. It is also recommended that your routinely unwrap the rug, clean it and check it for any signs of water or insect damage, before wrapping – or having it wrapped – again for storage, to ensure no damage is occurring. Foot traffic will naturally cause wear and tear to your rugs. This can’t be entirely avoided but you can lessen the damage by regularly turning your rugs so that foot traffic isn’t hitting the same parts of the rug over and over again. Further, moving your rug out of high traffic areas, where possible, is also a way to lessen foot traffic damage. Keeping your rug clean also helps lessen damage. Woven wool rugs form scales that can hold an incredible amount of dirt. This dirt can act like sandpaper as you walk on the rug, grinding down the pile and wearing away the surface of your rug. Weekly vacuuming helps lift dirt, sand and debris from the rug, and vacuuming and sweeping underneath the rug helps prevent dirt rubbing away at the backing. Finally, at least once a year you should book your rug in with a professional rug cleaner for a thorough deep cleaning in order to have all the accumulated dirt removed from the pile. Not only does this preserve your rug and protect it, but it also helps protect the health and well being of your family – especially those with allergies. Fringes, edges and ends of rugs are the areas that first parts of the rug that show age. It is incredibly important to keep them maintained in order to keep your rug in good condition. Further, repairs to these areas of the rug are often the most expensive to repair. While fringe can sometimes be replaced, all too often new or modern fringes look odd or inappropriate. Damaged fringe or finished edges also suggest that the rug might be threatened by wear and tear. 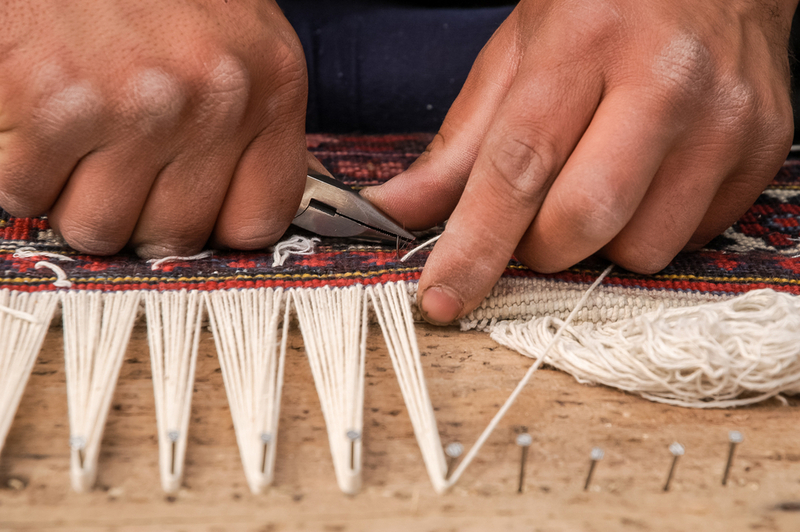 Rugs bound on their edges are done so in a number of ways to keep the foundation threads intact. If the foundation frays, then the rug may begin to lose its pile and require expensive repair work. Ends and edges, also known as selvages, need to be maintained or repaired as soon as you see damage occurring. This is something that needs to be done by a professional repairer to prevent further damage and so that edges, fringe and other end pieces match the rug. 7. Should I Use Rug Pads with my Oriental Rug? Rug pads are not a necessity but they can help to prevent accidents when rugs come in contact with slippery floor boards. You can choose the type of rug pad you want, from thicker pads that provide a more cushioned feeling under foot, to thinner rug pads that simply prevent slipping. However, most rugs will long outlive your rug pads so it is best to assess them regularly for replacement. Wanting to get your oriental rug cleaned? Preparing to put your precious rug into storage? Contact the team at Wood’s Rug Laundry today! We can help you out. Simply give us a call or fill in our simple online booking form!